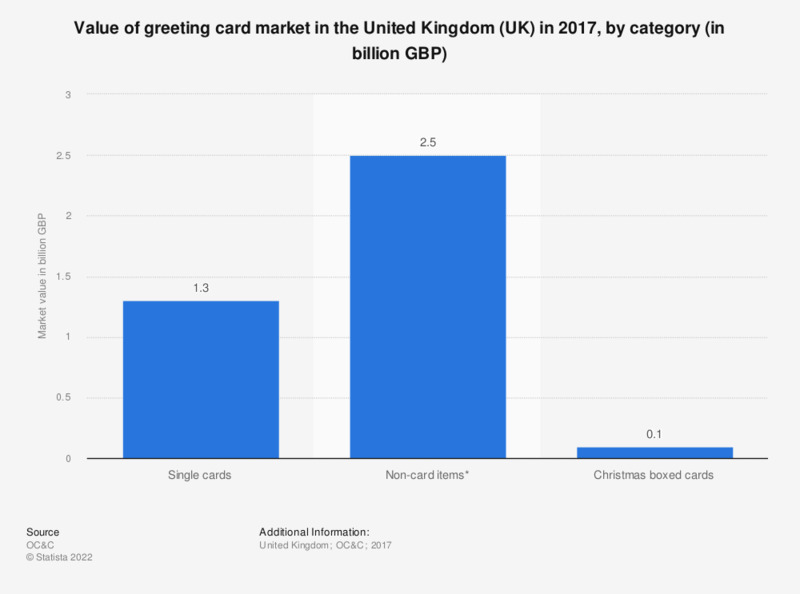 This statistic shows the value of the greeting card retail market in the United Kingdom (UK) in 2017, by the three main product categories: single cards, Christmas boxed cards and non-card items. The retail market for single greeting cards amounted to 1.3 billion British pounds in 2017. * Non-card items quoted as being worth 2-3 million GBP. Non-card items refer to adjacent product categories that customers are likely to puchase alongside greeting cards (and which greeting card retailers also tend to sell), including gift dressings/wrapping products, small gifts (e.g. soft toys, picture frames), party products (e.g. balloons, banners, badges) and other non-card products (e.g. calendars, stamps etc. ).